After 125-years of operating in the Dayton region, National Cash Register (NCR) abruptly announced plans to relocate to Georgia on June 2, 2009. 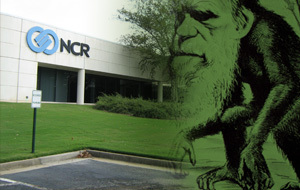 Starting in July 2009, NCR’s worldwide headquarters will move to Duluth, Ga. Meanwhile, the company will transplant its manufacturing operation in Columbus, Ga. Overall, the move will cost Dayton more than 2,100 jobs. NCR’s decision to relocate came as a shock to the Dayton community, which had had very little discourse with the company in the months preceding the announcement. Shock swiftly turned to resentment as Ohio’s elected officials voiced their dissatisfaction with NCR’s apparent indifference. In an audio clip from his official website, Sen. Sherrod Brown (D-OH) said, “I’m unhappy with NCR. They’re a 125-year-old Dayton company that always had community support. Hundreds of workers and their families had built this company in the Miami Valley and I was not at all happy, nor was the Chamber of Commerce and the Mayor and others in Dayton, with NCR’s executives’ unwillingness to even work with people locally and unwillingness to talk to people from the Governor on down” ( “Brown Expresses Disappointment in NCR Decision and Vows to Help Affected Workers”). Yet, an even greater shock was the revelation that Georgia used money from the American Recovery and Reinvestment Act (ARRA) to facilitate the NCR deal. According to Senator Jon Husted (R-Kettering), the city of Columbus was planning to use federal stimulus funds to pay for the purchase of a former Panasonic building to accommodate NCR’s coming manufacturing operation. In turn, NCR would lease the building back to Columbus. Husted was outraged over the possibility of federal stimulus money being used to subsidize NCR’s relocation (Husted). “So, essentially, Ohio’s taxpayers are on the hook through the federal stimulus program to basically pay for NCR’s move to Georgia,” Husted said. “It’s outrageous. I’m calling on our members of Congress to immediately act by asking President Obama and others to stop this” (ibid). Husted isn’t the only one who opposes such use of federal stimulus money. In June 3 letter, Congressman John Boehner (R-West Chester) and Congressman Turner (R-Dayton) appealed to President Barack Obama to prevent the use of economic recovery money to subsidize state-to-state job relocation. To be sure, Turner and Boehner share Husted’s Republic predilection. Yet, opposition to Georgia’s stimulus spending transcends partisan affiliations, as is evidenced by a June 3 letter written by Sen. Sherrod Brown (D-OH) to Commerce Secretary Gary Locke. In the letter, Brown stated, “The purpose of the ARRA is to create or retain jobs, not to relocate them from state to state. Stimulus funds should not be used in a manner that benefits one local economy at the expense of another, whether the request comes from Columbus, Georgia or Columbus, Ohio” (“Brown on Georgia Request for Funds to Build NCR Facility: Stimulus Should be Used to Create Jobs, Not Relocate Them”). The use of $1.2 million to “save” the jobs of Columbus police recruits who will probably be laid off anyway in 2010 (“Police officers saved by stimulus may still lose jobs”). The allocation of $1.1 million to treat groundwater at the Cold War-era RMI Extrusion Plant, which was already ruled safe in 2007 (“Stimulus-funded cleanup of toxins might be moot”). The creation of a $57 million slush-fund to finance the study of projects that may never be constructed (LaHood Letter). Husted contends that such episodes of stimulus mismanagement are attributable to the hasty manner in which the ARRA was passed (Husted). Only 12-hours after being penned in the office of Congresswoman Nancy Pelosi (D – CA), the $787 billion fiscal stimulus was put to a vote. Not a single lawmaker had the opportunity to read the voluminous bill (“GOP Leader Boehner Floor Speech Opposing Democrats’ Trillion-Dollar Spending Bill”). “This is what happens when you railroad something through without examining it,” Husted said. “We have one hand not knowing what the other hand is doing. Frankly, one bill created a problem that they’re now using another part of the same bill to solve. It’s horrible. It’s a waste of tax dollars” (Husted). Husted stated that the recent revelations concerning Georgia’s use of ARRA funds raises broader questions regarding the allocation of stimulus money. Husted said, “We know about this, but how many other cases are there in this country where we are allowing one state to outbid another state for jobs that already exist? How many hundreds of millions in stimulus dollars could be wasted doing this kind of a thing. It’s unconscionable. In Ohio, we used our stimulus money to balance the budget. But, other states that aren’t in our situation are apparently using their dollars to basically buy businesses that exist in other states” (ibid). Indeed, Husted poses a disturbing question: Just how many other states have used stimulus dollars to curry favor with corporations? If this is the case, corporate interests stand to become the chief beneficiaries of the federal stimulus program. If stimulus money is being used by states to court corporations, then taxpayer dollars are being used to subsidize the relocation of already existing jobs. Such a state of affairs hardly fosters economic growth. Infrastructure is not being built, just displaced. Meanwhile, the fiscal stimulus, which is constituted by taxpayer dollars, only stimulates Big Business. In this sense, the Obama Administration’s economic recovery plan could actually be nothing more than the conduit for an enormous wealth transferral to corporate interests. Simultaneously, the economic recovery plan could be fostering a social Darwinian climate where states must use stimulus funds as weapons in a struggle for economic survival. In the scientifically regimented state, the citizen becomes little more than an amalgam of behavioral repertoires whose every thought, feeling, and idea is the product of external stimuli. From the scientistic vantage point, the populace’s motivations can be calculated and systematized, thereby allowing those few conditioners who are accountable to no moral master to develop economic and technological stimuli that can produce the desired patterns of mass behavior. Such a societal model is known as a Technocracy, which Frank Fischer defines as follows: “Technocracy, in classical political terms, refers to a system of governance in which technically trained experts rule by virtue of their specialized knowledge and position in dominant political and economic institutions” (17). It is possible that such sociopolitical Utopian ideas also resonated with President Franklin Roosevelt, who was a 32nd degree Freemason. This contention is strengthened by the technocratic pedigree of FDR’s New Deal. In the early days of the 1932 election, technocratic theoretician Henry A. Porter published Roosevelt and Technocracy . The book raised an interesting question: “Will TECHNOCRACY be the New Deal?” (45). Based on his observations of FDR’s policies, Porter gravitated towards the affirmative. In fact, Porter made no effort to conceal his approval of FDR: “Only skillful statesmanship–the statesmanship of Roosevelt, and sound economic principles–the principles of Technocracy, can lead us out of the valley of Chaos and Despair into which we are plunging” (71). Meanwhile, technocratic enclaves in California even promoted “the granting of dictatorial powers to Franklin D. Roosevelt” (Akin 83). Indeed, the New Deal facilitated the technocratic restructuring of America. One case in point was the Social Security Act, which was inspired by a retired physician named Dr. Francis Townsend. Cribbing from Looking Backward, a piece of normative fiction by Freemason and socialist Utopian Edward Bellamy, Townsend developed a federal program that would have allocated $200 a month to unemployed citizens over the age of 60 (Crabtree 104). According to Townsend’s hypothetical plan, the recipients of this financial assistance would be required to spend their allotments of $200 within 30-days (104). Although Congress did not pass the Townsend Bill, the legislation did inspire the Social Security Act (105). In this sense, Social Security was one of many New Deal machinations that originated with technocratic theoreticians. 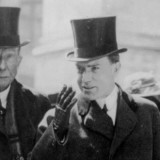 James Dowell Crabtree reiterates: “In this way, one might say that the Technocrats did indeed have an indirect influence on the New Deal, by way of the contributors to their doctrine (Bellamy) to an activist who espoused their ideas of guaranteed income (Townsend) and finally into law” (105). In addition to this program of “guaranteed income,” the New Deal would create a vast constellation of government agencies. These included the Civilian Conservation Corps (CCC), the Public Works Administration (PWA), the Agricultural Adjustment Administration (AAA), and, most notably, the National Recovery Administration (NRA) (Crabtree 106). Of course, such labyrinthine organizational compartmentalism reflected the massive bureaucratization endemic to technocratic models of governance. Crabtree observes that this new “[c]entralized and functional” monolith was similar to the continental administration advocated by Technocracy Inc. (106). The impact of this model would leave a “permanent mark” on America’s federal government (106). The era of Big Government had begun. 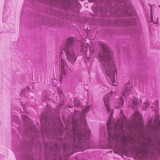 In The New World Order , H.G. Wells synopsizes the New Deal as follows: “The New Deal is plainly an attempt to achieve a working socialism and avert a social collapse in America; it is extraordinarily parallel to the successive ‘policies’ and ‘Plans’ of the Russian experiment. Americans shirk the word ‘socialism’, but what else can one call it?” (46). Of course, socialism is disseminated on the popular level under various appellations and in a myriad of forms. For instance, in 1933, Hitler candidly admitted to Hermann Rauschning that: “the whole of National Socialism is based on Marx” (Martin 239). Nazism, which was merely a variant of fascism, was derivative of Marxism. The historical conflicts between communism and fascism were merely feuds between two socialist totalitarian camps, not two dichotomously related forces. Benito Mussolini once opined: “Fascism should more appropriately be called Corporatism because it is a merger of state and corporate power.” This was precisely the form of socialism that the New Deal enshrined. According to Srda Trifkovic, Corporatism as it was implemented in Mussolini’s Italy, was a central preoccupation of the policy professionals that surrounded FDR: “Roosevelt and his ‘Brain Trust,’ the architects of the New Deal, were fascinated by Italy’s fascism–a term which was not pejorative at the time. In America, it was seen as a form of economic nationalism built around consensus planning by the established elites in government, business, and labor” (“FDR and Mussolini, A Tale of Two Fascists”). While Malanga fails to identify Corporatism as simply another variety of socialism, his assessment of the Obama Administration’s co-option of GM is absolutely correct. Moreover, his observations concerning the Corporatist “notion that elite groups of individuals molded together into committees or public-private boards can guide society” underscores the technocratic character of Corporatism. Again, the concept of a Technocracy originated with the sociopolitical Utopians of the Enlightenment, which, in turn, spawned all modern socialist revolutionary movements. This is the ideological heritage of those who people the Obama Administration. It is also the ideological heritage of Pelosi, who proudly invoked the phrase Novus Ordo Seclorum. That the stimulus bill was penned in Pelosi’s office in a rather obscurantist fashion suggests that a radical agenda is being enacted. In fact, Pelosi has ties to socialists of both the communist and fascist ilk. The fascist side of Pelosi’s pedigree may be found by exploring the background of one of her major benefactors, Gordon Getty, the son of oil tycoon J. Paul Getty. While he is a republican, Getty has acted as a “major fundraiser for local and national Democratic Party candidates” and has even contributed to Pelosi’s campaign coffers (“Gordon Getty”). Gordon’s deceased brother, J Paul Getty Jr., provides a bridge between Pelosi and old-school Nazis. J. Paul Jr. was a director of TCI, a high technology firm based in Sacramento (Carey). In 1970, J. Paul Jr. made Otto Albrecht von Bolschwing TCI’s president (ibid). What is little known about von Bolschwing is the fact that “he became a Nazi party member at the age of 24, the only member of his family to do so” (ibid). According to the Justice Department, as an SS captain he [von Bolschwing] helped plan the expulsion of Jews from the German economy and developed anti- Jewish propaganda to force their emigration from Germany (ibid). In 1938, von Bolschwing was collaborating with a group of Palestinian Germans who, according to a history of the SS by Heins Hohne, “lined their pockets by certain extramural activities” (ibid). Von Bolschwing was also spying on the Zionist Hagana army, a Jewish paramilitary organization that was part of the British Mandate of Palestine and would later become the nucleus of the Israeli Defense Force (ibid). These activities would cease when the British expelled von Bolschwing from Palestine for espionage (ibid). The expulsion, however, did not end von Boslchwing’s Nazi activism. He reemerged in Romania as a government “oil expert” and, in 1941, assisted the leadership of the Iron Guard, Romania’s fascist political (ibid). With von Bolschwing’s help, the Iron Guard fled to Berlin after having “gone on a three-day rampage in which many jews – the estimates vary considerably – were killed” (ibid). That same year, von Bolschwing may have played a role in the Aryanization of Dutch property when he joined the Bankvoor Oenroerende Zachen (ibid). It is the assertion of investigations that the Amsterdam bank forced the sale of “Dutch Jewish farms, businesses, homes and securities” (ibid). In August of 1941, it appears that an anti-Nazi veneer was being constructed for von Bolschwing. With no formal charges against him, von Bolschwing was thrown into a Gestapo prison and then inexplicably released in April 1942 (ibid). In 1945, von Boslchwing assisted American troops entering Austria in the capture of Nazi officials and SS officers (ibid). This helped von Bolschwing gain the trust of U.S. Army Intelligence and the Nazi was soon working for the CIA as the end of World War Two gave rise to the East/West dialectical climate of the Cold War. 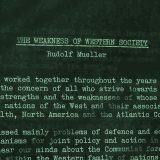 The Western power elite and their agents that comprise the sinister elements within the Intelligence Community hoped to use Nazis to manage the Cold War dialectic. The power elite required the existence of the Soviet menace to provide an adequate pretext for world government, but they could never let the communist world become powerful enough to overwhelm them. The Nazis who escaped prosecution at the end of the war were supposed to help maintain the delicate balance. For this purpose, former Nazi spymaster Reinhard Gehlen “helped the CIA build a spy network in postwar Europe, then became head of postwar German intelligence activities” (ibid). It is believed that von Bolschwing “became the controller of Gehlen’s CIA operation after Gehlen returned to the German government” (ibid). He became an assistant to the director of international marketing at Warner Lambert Pharmaceuticals Co., developing close ties to the company’s president, the late Elmer Bobst, and its honorary board chairman, former New Jersey Gov. 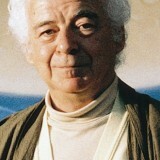 Alfred Driscoll, according to a close associate. As was stated above, it is believed von Boslchwing took over Gehlen’s operation after Gehlen went back to Germany (ibid). Is Pelosi a conscious or unconscious agent of this postwar Nazi infrastructure? Another intimation of Pelosi’s socialist propensities is the relationship between von Bolschwing and William Newsom, a retired state appeals judge and the father of current mayor of San Francisco, Gavin Newsom. William Newsom became acquainted with von Bolschwing in 1969-70 when he was an attorney for TCI (ibid). Newsom and von Bolschwing traveled Europe together on Behalf of TCI during this period of time (ibid). The Pelosi family is extremely close to William Newsom. Pelosi’s brother-in-law was once married to William Newsom’s sister (Finnie) The Newsom family has shown a fascination with socialist ideas, and Gavin has even put some of those ideas into political practice during his mayoral career. In 2002, Gavin launched a universal healthcare program entitled Healthy San Francisco and declared that the plan “can be duplicated across the country if our elected officials are willing to take risks instead of continuing the status quo” (Newsom). Under Gavin, San Francisco also joined the Kyoto Protocol, an agreement that would seriously retard economic and technological growth in industrialized nations in the name of reducing greenhouse gases (“Gavin Newsom”). Such measures are recognized by astute observers as socialism and similar initiatives have been promoted by socialists of both the fascist and communist ilk. Pelosi’s thinking has also been shaped by Marxists of the communist variety. On March 17, 1999, Congresswoman Pelosi made a floor statement on behalf of the recently deceased Vivian Hallinan (Pelosi, “On the Passing of Vivian Hallinan”). Pelosi referred to the Hallinan clan as “one of San Francisco’s great Irish families” (ibid). During a March 25, 1999 floor statement, Pelosi shared a tribute to Vivian Hallinan written by Seth Rosenfield in the San Francisco Examiner. Rosenfield’s tribute revealed that Hallinan “held ‘socialist’ views” and that, during the 1980s, Hallinan had “befriended Daniel Ortega, Nicaragua’s Sandinista leader” and had met Fidel Castro (Pelosi, “On the Passing of Three Extraordinary Women”). While Wallace may have been an unwitting parrot for the Kremlin, Hallinan’s hobnobbing with Soviet surrogates such as Castro and Ortega suggests that she was anything but one of the naïve innocents of the Progressive Party. The evidence weighs heavy in favor of the contention that the Hallinans were ideological communist. Pelosi’s political career suggests that some of that ideology has rubbed off on her. Pelosi’s association with the Getty and Hallinan clans have produced a dangerous political radical that draws her beliefs from the worst features of both fascist and communist thinking. What is especially disturbing is the fact that this particular radical is the Speaker of the House. Worse still, the federal stimulus package was penned in the Speaker’s office. Again, it is important to note that the stimulus bill rushed to a vote without being reviewed by a single lawmaker. Did Pelosi fear that lawmakers might identify the radical elements of the ARRA? A White House official, who spoke on condition of anonymity, said no stimulus money has been awarded, “and the administration obviously had no role in the relocation,” noting that NCR had decided to move before Georgia officials said they would apply for the money. Spencer coined the phrase survival of the fittest, and Darwin adopted the parlance in later editions of his Origin of Species. Spencer used this principle–where competition for limited resources results in the survival of the inherently “better” candidate–to explain past, present, and future social conditions. Darwin never extended the principle beyond the biological realm and remained wary of Spencer’s speculative extrapolation into the sociological. Social Darwinism is really social Spencerism, but the fact that the idea has been misnamed has not made it any less powerful. Thus, Darwin’s theory of evolution was not formulated in a vacuum. As is evidenced by the contents of his notebooks, Darwin already harbored a pre-existing Weltanschauung that he was attempting to scientifically dignify. This Weltanschauung embraced savage, unregulated competition and free trade, which are two pillars of modern monopolistic capitalism. Evidently, Darwin was not so “wary of Spencer’s speculative extrapolation into the sociological.” Spencer’s “speculative extrapolation” of evolutionary theory was no theoretical error. It was the logical outworking of the Darwinian Weltanschauung. Of equal interest are those parties that seem to have shaped Darwin’s Weltanschauung. One of Darwin’s dinner guests was Harriet Martineau, a sociologist and Comtean sociocrat (264). Her Poor Laws and Paupers Illustrated was recommended to Darwin by his sisters (153). Martineau characterized the poor as the “gangrene of the state” and endorsed the genocidal Poor Law Amendment (153-54). Secret commission reports concerning this unpopular law were made available to Martineau by Lord Chancellor Henry Brougham (153). Poor Laws and Paupers Illustrated also did ” more to the pave the way for the new Poor Law than all of the government propaganda” (153). Martineau was a “darling of the Whigs,” a political party that promoted the Poor Law Amendment Bill (153). Martineau reiterated the Whigs’ platform, contending that the reforms being proffered by the bill would encourage self-sufficiency among the poor (154). This contention was patently bogus. By immediately thrusting unskilled paupers into a competitive job market, the Whigs were actually “decreasing labour costs and increasing profits” (154). Thus, one could convincingly argue that Martineau was merely the whore for corporate interests. That Martineau’s corporate apologia influenced Darwin is highly likely. Her work drew the attention of Freemason Erasmus Darwin, Charles’ grandfather. Writing to Darwin during his Beagle voyage, his sisters revealed that: “Erasmus knows her [Martineau] & is a great admirer & everybody reads her little books & if you have a dull hour you can, and then throw them overboard, that they may not take up your precious room” (Qutd. in Desmond and Moore 153). Erasmus Darwin would develop “every important idea that has since appeared in evolutionary theory” (Darlington 62). Moreover, Martineau subscribed to Malthus’ concept of carrying capacity, a myth that was central to Darwinian evolution. Astride Martineau’s “edifying homilies,” Malthus’ theoretical eschatology enjoyed widespread exposure (Desmond and Moore 153). Martineau’s proselytizing was very effective. One pundit insisted that credence to Malthus’ demographic prognostications promised to do “more for the country than all the Administrations since the Revolution” (qutd. in Desmond and Moore 154). The logical bankruptcy of Malthusianism and Darwinism has never dissuaded the ruling class from vigorously promoting these two doctrines. Malthus’ Essay overlooked the role of human innovation in the enhancement of subsistence production methods. Still, Malthus concluded that society should adopt certain social policies to prevent the human population from growing disproportionately larger than the food supply. Of course, these social policies were anything but humane. They stipulated the stultification of industrial and technological development in poor communities. With the inevitable depreciation of vital infrastructure, society’s “dysgenics” would eventually be purged by the elements. According to Malthus, such sacrifice guaranteed a healthy society. Of course, the only parties that would profit from such a societal configuration were those who occupy the highest layers of socioeconomic strata. Likewise, Darwinism’s logical insolvency betrays the theory’s true function as a mechanism for social control. Darwinism has never demonstrated one instance of speciation. Moreover, the theory’s preoccupation with survival as the sole purpose of existence cannot account for human cultural institutions like art. However, Darwinism provided the pseudo-scientific rationale for genocide and oppression. These are two practices that elitists have refined and turned into virtual “arts.” All that Darwin did was scientifically dignify the bloody medium employed by the aesthetic terrorists of oligarchy. [T]he thing that seems to bind these two groups [Transnationalists and Internationalists] most closely in practical terms is that at heart, and philosophically speaking, both are sociopolitical Darwinists. Of course, the Pope doesn’t for a moment imagine that such activists as these are likely to take time out from their total immersion in world affairs to formulate their basic group philosophy in the same way that the Humanists have. There is no Internationalist or Transnationalist equivalent of Professor Paul Kurtz’s Humanist Manifesto II. While the internal contradictions of Rockefeller’s Weltanschauung reveals a slightly disingenuous adherence to the Darwinian conception of competition, other monopolists concluded that they were “naturally selected in the crucible of competition” (Milner 412). Thus, many of them implemented the same tactics employed by Rockefeller. Like Rockefeller, several monopolists financed communism’s rise in hopes of expunging their competitors from the marketplace and maintaining their evolutionary primacy. Likewise, several monopolists financed the rise of fascism, specifically Hitlerian fascism. As was previously established, fascism is more succinctly categorized as corporatism, the marriage between Big Business and Big Government. Like communism, corporatism facilitates the formation of monopolies by regulating competitors out of business. In the case of the fascist (i.e., corporatist) regime that has become entrenched in America, its evolutionary character has been demonstrated by the President’s subtle repeal of the global gag rule (Sullivan). The NCR stimulus scandal further elucidates the Obama Administration’s pervasive social Darwinism. It is interesting to note that “godfather” Kristol was a Trotskyist in his youth. 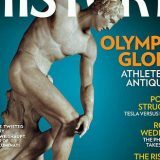 Kristol makes it clear that he is unrepentant: “I regard myself lucky to have been a young Trotskyist and I have not a single bitter memory” (13). The statist tradition of FDR’s Marxism was also carried on by the neocons, as is evidenced by Kristol’s own words: “Neocons do not feel that kind of alarm or anxiety about the growth of the state in the past century, seeing it as natural, indeed inevitable” (“The Neoconservative Persuasion”). In other words, Limbaugh and his fellow travelers are not committed to dismantling Big Government. 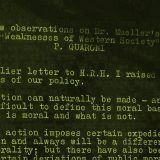 Instead, they wish to harness it like some impersonal force and redirect its totalitarian machinations against their dialectical rivals on the so-called “left.” No doubt, such a shift in power would only witness more scandals like the NCR stimulus debacle. Ultimately, the political left and the political right merely constitute competing criminal syndicates in a battle for hegemony in the emergent world order. Obama is just the latest marionette in a series of puppets for sociopolitical Darwinians. His presidency, like so many others, is devoted to preserving the survival of the richest. Crabtree, James Dowell. Progressivism, the New Deal, and the Technocratic Movement of the 1930s . Dayton, Ohio: Wright State University, 1995. Darlington, C.D. “The Origin of Darwinism.” Scientific America 200 (1959): 60-66. Desmond, Adrian and James Moore. Darwin: The Life of a Tormented Evolutionist . New York, NY: Warner Books, 1991. Ghent, William. Our Benevolent Feudalism . New York: Macmillan, 1902. Howard, Michael. The Occult Conspiracy . Rochester, Vermont: Destiny Books, 1989. Husted, Jon. Telephone Interview. 3 June 2009. Huxley, Aldous. Brave New World Revisited . New York: Bantam Books, 1958. Kristol, Irving. Neo-conservativism: The Autobiography of an Idea . New York: The Free Press, 1995. Milner, Richard. Encyclopedia of Evolution . 1990. Porter, Henry A. Roosevelt and Technocracy . Los Angeles: Wetzel Publishing Company, Inc., 1932. Schapsmeier, Edward L. and Frederick H. Schapsmeier. Prophet in Politics: Henry Wallace and the War Years, 1940-1965 . Iowa: Iowa State UP,1970. Strickland, Ted. Telephone Interview. 5 June 2009. Turner, Michael. Telephone Interview. 8 June 2009. Wells, H.G. The New World Order . 1940. FQ Classics, 2007.